An intercom (intercommunication device), talk back or door phone is a stand-alone voice communications system for use within a building or small collection of buildings, functioning independently of the public telephone network (Azori 2016). Intercoms are generally mounted permanently in buildings and vehicles. Intercoms can incorporate connections to public address loudspeaker systems, walkie talkies, telephones, and to other intercom systems. Some intercom systems incorporate control of devices such as signal lights and door latches. Visualize the enormous sense of security which you get when you’re aware of the person present at the other side of the door of your home or office premises. This is exactly what we strive to achieve with our ip intercom system Dubai. The need for achieving a fool proof security by employing sufficient security measures permeates every business. There’s also the need for controlling access to specific areas and to monitor activity and permit entry to only to designated and authorized people. For the easy entry management and access control, you certainly need the IP intercom system. Dubai is growing by heaps and bounds and so it the need for security. With intercom system, you’re a relieved of all the worries every time someone rings the bell. An audio and video ip intercom in Dubai could help in securing your premises by enabling you to confirm visually, and audibly talk with the visitors at your home or business, without opening the doors. We are among the leading IP intercom system provider in Dubai. Among all the IP intercom system Dubai, UAE, we provide products and services that have always been sought after by the businesses. We take pride in building a strong reputation and trust as one of the dependable companies when it comes to quality security solutions. Our range of intercom systems covers an entire spectrum- from entry-level products to value-packed, high-end systems. Intercom systems secure houses and office premises with the supreme technological mastery and exceptional sophistication. By installing the door Ip intercom systems, you would increase not just the security of your home, but also the ease of managing your everyday household chores. The IP intercom system could even be intended to enable you to make intercom calls from one handset to the other, such as calling from your kitchen to your garage, calling within separate dwellings or calling between floors. Our video IP intercom in Dubai enable you to see who’s there on the outside of the house before allowing them in. It offers the peace of mind to you and your family as it helps you to allow entry only to people whom you trust. We offer a full-fledged video intercom systems service for helping you find the top systems for your premises. We assist in assessing the requirements of your properties and help you to discover the video intercom systems which would provide the best security within your budget. 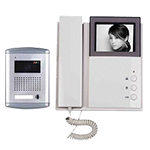 We offer complete video and audio IP intercom system Dubai, solutions depending on the requirements of the clients. Our committed team of engineers could design the system which is best appropriate for your premises. As among the best video and audio intercom dealers in the UAE, it’s our commitment to ensuring availability of high-quality products for our customers. Our products like IP intercom in Dubai are chosen carefully among the top brands globally so as to preserve a standard of highest quality in all of our offerings. If you need any further information with respect to intercom systems, don’t hesitate and call us today!